Several months ago, Samsung made headlines with the announcement of the Galaxy Note Edge – a phablet like no other. It stood out with the curve its screen sported on its right side, where notifications and interface items could be placed for quicker access. Today, another curvy handset is joining Samsung's Galaxy ranks, and if you've been following the news, you surely know we're talking about the Samsung Galaxy S6 edge. As they're both high-end Androids by Samsung, the Galaxy Note Edge and the Galaxy S6 edge have a lot in common, but there's also a lot that sets them apart. So let's take a closer, side-by-side look at the two and see how they differ. We feel like we should start by getting the obvious out of the way – the Samsung Galaxy S6 edge resides within smartphone territory, while the Galaxy Note Edge is a full-fledged phablet device. The former is smaller, thinner, and much lighter compared to the latter, which makes the Galaxy S6 edge easier to grasp and handle compared to the Note Edge. The 160-pixel wide curved right side of the Note Edge's screen serves as a hub for notifications while the handset is in stand-by and as a tray for app shortcuts when the handset is in use, not to mention that it looks cool and futuristic. 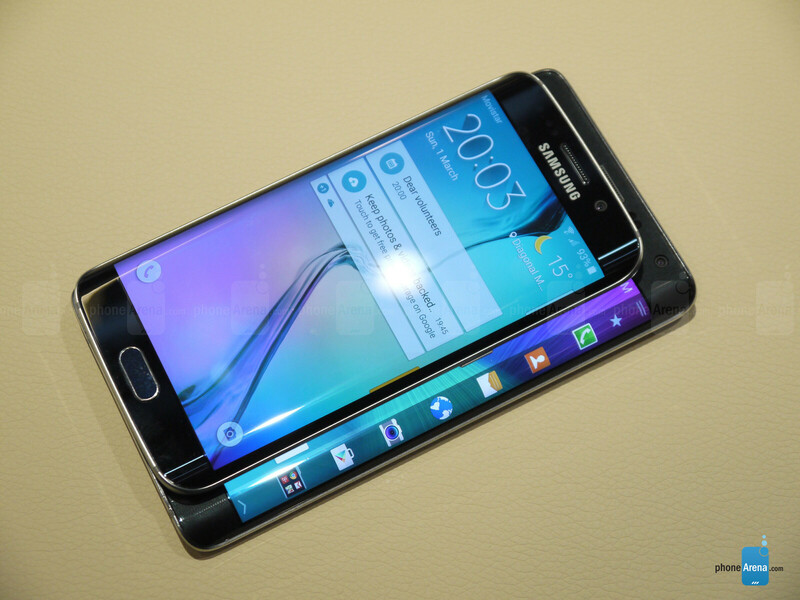 The Galaxy S6 edge, however, has two symmetrical curved edges instead of one, so it is more pleasant to look at. While they aren't quite as spacious, they do have their purposes besides making the phone look awesome. For example, the curves provide quick access to certain notifications, such as missed calls or texts from a favorite person, and may act as a shortcut to a particular contact. They also light up nicely when the phone is laying face-down and a call comes. The build quality of both phones is top-notch, as it should be on a premium smartphone. As the Galaxy Note Edge, the Galaxy S6 edge features a metal frame around the sides, providing sturdiness, all while feeling solid when the phone is being held. Turn the phones around and you'll see a key difference between the two. While the Note Edge features a leather-like soft-touch finish, the back Galaxy S6 edge is covered by a layer of Gorilla Glass 4. It goes without saying that the latter is shiny and fancy-looking, but attracts fingerprints, unlike the Note Edge's back cover. Before we proceed further, we must note that the Samsung Galaxy Note Edge comes with Samsung's trademark stylus, the S Pen. It is primarily meant to be used for taking down notes or sketches, but navigating the UI with it is also possible and convenient. There's no S Pen included with the Samsung Galaxy S6 edge, although that's hardly a deal breaker, in our opinion. With their high-res, Super AMOLED displays, the Samsung Galaxy S6 edge and Galaxy Note Edge treat your eyes to beautiful, detailed visuals. Both pack 1440 by 2560 pixels of resolution, which translates to the outstanding 577 and 525 pixels per inch, respectively. 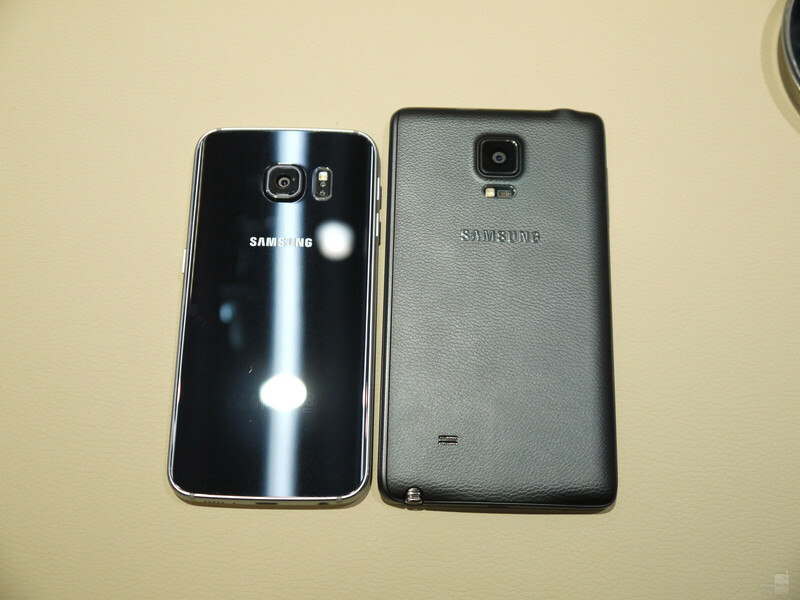 Size-wise, the screen on the S6 edge measures 5.1 inches, while the Note Edge provides 5.6 inches of real estate. Colors on the two are vivid, as is typical for Super AMOLED screens, yet their reproduction can be tweaked from the Settings menu should you prefer color fidelity over vibrancy. While the brightness output of around 500 nits for the Note Edge's display is respectable, the Galaxy S6 edge can shine even brighter, reaching peaks of around 600 nits, according to its maker. This ensures the good outdoor visibility of both displays. Furthermore, the two phones can have their screens dim down to a few nits for an easy-on-the-eyes experience during the night. It should come as no surprise that the Samsung Galaxy S6 edge runs Android 5.0 Lollipop out of the box. The Samsung Galaxy Note Edge has received its dose of Lollipop as well, which puts it on the same page as far as software versions go. Still, the Galaxy S6 edge has the advantage of running the latest version of Samsung's custom user interface known as TouchWiz. While still based on the principle of packing as many features as would fit, the new UI is overall simpler and more user-friendly. Plus, it brings support for interface themes to the table, allowing users to radically change the looks of the software. An enhanced version of KNOX caters to the needs of enterprise consumers, while Samsung's mobile payment system - Samsung Pay - is to arrive in the near future. Hopes are that the Samsung Galaxy Note Edge will be treated to the same TouchWiz experience one day, although that's still to be confirmed. The Galaxy Note Edge is powered by the 32-bit quad-core Qualcomm's Snapdragon 805 SoC, while the Galaxy S6 has a homemade Samsung chip humming under its hood – a 64-bit octa-core CPU, built on a 14 nm process, which should mean faster performance and more energy efficiency. Both handsets have pretty potent hardware, but the Galaxy S6 edge sports a newer, bleeding-edge SoC, which undeniable shows in the results. Additionally, the new Sammy flagship employs a new UFS 2.0 technology for its flash storage, which should be 2.7 times faster than the currently used NAND flash. It also has 3GB of super-fast LPDDR4 RAM, allowing more room and speed for multitasking. A hardware test code revealed to us that the Galaxy S6 sports a Sony Exmor IMX240 sensor, which is, presumably, the same one that can be found on the Samsung Galaxy Note 4 and Note Edge. The sensor has a 16 MP resolution and a wide F1.9 aperture, which is said to allow much better low-light photo taking. Even if it really is the same sensor, there can still be differences in the way the phone post-touches images with its software and from the few comparison snaps we managed to take, we'd say that even though the photos appear similar, there is a definite difference in the end product. The Galaxy Note Edge has a 3,000 mAh battery keeping the lights on for 7 hours and 8 minutes on our battery life test - a very good result overall. Now, the Galaxy S6 edge sports a smaller 2,600 mAh juicebox, which may or may not wield the same results, thanks to the energy efficiency of the CPU that Samsung is using in its newest flagship. The S6 edge still has Samsung's Ultra Power Saving mode to help users get through those times, when they spend too much time away from an outlet, but we wonder – how often would we have to use that mode with the new phone? We can't wait to get our hands on a unit and find out, sometime in the future. The S6 and S6 edge do have one cool new feature, though, and that's wireless charging. Which standard, you ask? Both the major ones! That's right, the new Sammy flagships support WPC and PMA mats, so that you'd be covered no matter what you have on hand. 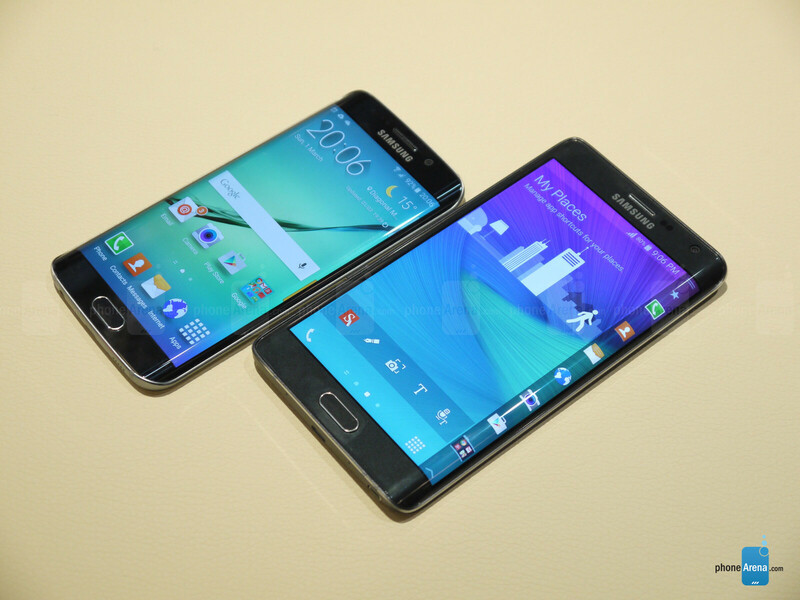 The new Galaxy S6 devices have definitely raised the bar of what we expect from Samsung in the future. The company made the jump from plastic, dull flagships, to a premium-looking, unibody metal-and-glass design in just a year. The Galaxy Note Edge, however, is not to be disregarded, as it is a step in this evolution of Samsung's design language, and a pretty good one at that – a beautiful chamfered metal frame and an elegant faux-leather removable back cover adorn the device and it just looks good! However, looks aside, the Galaxy S6 edge is the next step in hardware evolution, there's no denying that. A power-efficient 64-bit processor and super-fast RAM and flash memories are a sure sign of that. Add a simplified, thinned-out TouchWiz interface, and you've definitely got a handset that we'd call "better", even if not by a long shot, than the Note Edge. Mmhm, don't you think it's because time in Barcelona differs in 12 hours from US? Unlike the note edge the samsung galaxy s6 has no removable battery and no memory card expansion. Samsung has always wanted to be like apple and now they have their very own samsung iphone. The question is, how good is this device as a phone. S5 on Verizon had/has lots of radio problems when it comes to receiving and making calls. I returned mine. The S5 on Verizon didn't have radio problems. The “issue" with the radio comes during manufacturing. Samsung sends out all their devices in “Global Mode." That isn't properly compatible with Verizon. You have to switch the device to “LTE/CMDA" mode and then turn on advanced calling.